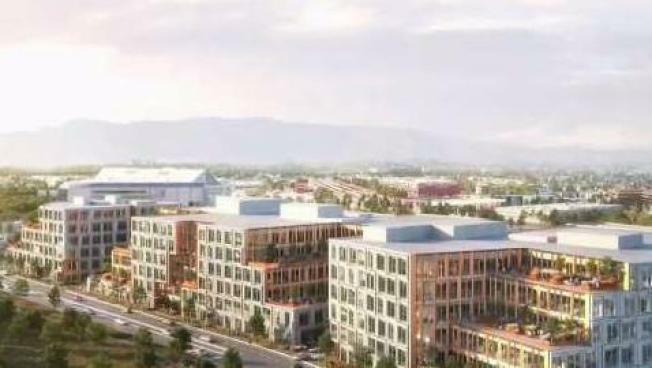 San Jose city leaders gave final approval to a massive downtown office complex that will bring with it both upgrades and concerns about housing. Construction of the 1 million-square-foot complex will begin soon on the block between Autumn Parkway and West Julian Street. The new development is expected to house an estimated 5,000 workers. "It's gonna bring a variety of upgrades and improvements to the surrounding open spaces," said Peter Leroe-Munoz of the Silicon Valley Leadership Group. Spaces certainly seem to be opening up in the area as nearby businesses already are moving away, prompting questions about whether the addition of Google's massive downtown village makes the area too tech-friendly. "I think it's gonna be great for the downtown area, for Google coming in, but I do know people are gonna suffer for housing, because everything's gonna be super expensive," resident Heidi Kern said. That was the theme of a protest outside Google's marketing conference at McEnery Convention Center in San Jose. Demonstrators in tents and with signs stood outside, asking the tech giant for housing help. "If they wanna be a good neighbor and move into San Jose, they gotta address its impacts," said Jeffrey Buchanan of Silicon Valley Rising, a coalition of labor, faith leaders, community-based organizations and workers. "In a project like this, not only do you have high-priced engineers and programmers, but you have cafeteria workers, shuttle drivers, people who work in security that are being paid poverty wages. They can't afford the housing prices here in San Jose." Some said one of the advantages of the new site is accessibility to public transit, with Caltrain and VTA light rail trains stopping at nearby Diridon Station and when BART eventually extends into downtown San Jose. CORRECTION: (Wednesday, July 11, 2018, 10:45 a.m.): An earlier version of this story incorrectly stated that Google was involved with the approved office complex.